The INFLUENTIAL welcomes guest host and interviewer, Jonathan Kilman, Chairman of Converge Government Affairs (www.convergegov.com). Jonathan “flips the script” by interviewing INFLUENTIAL publisher Patrick Slevin (www.PatrickSlevin.com) in this special edition: Patrick Slevin the Death Racer. Jonathan: Dealing with the unknown, unexpected and unimaginable tests a leader’s skills as a strategist, communicator and risk taker. 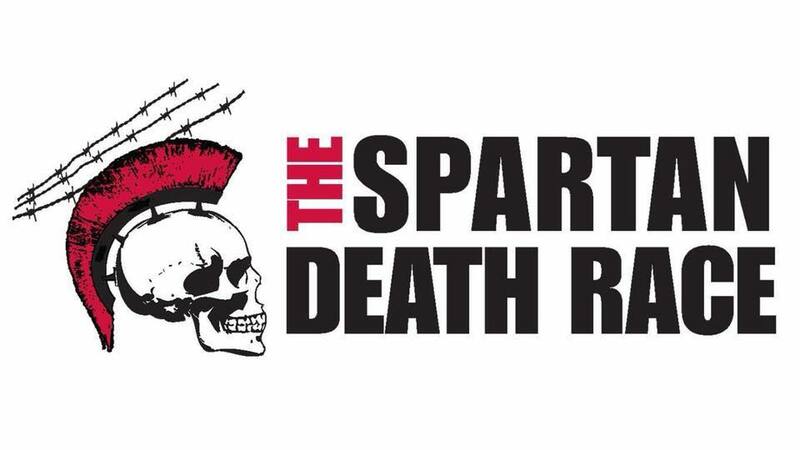 In the extreme endurance racing world, nowhere do these traits get tested more than in the 2018 Spartan Death Race, which Patrick Slevin recently competed. Welcome Patrick to the other side of the INFLUENTIAL interview. Patrick: (Laughing) Thank you Jonathan for guest hosting the interview on my latest Death Race. Jonathan: Watching you train and ultimately compete has given me some insight into your incredible discipline, physical and mental toughness, and your sheer desire to win. Many people may not know about Death Race, as it is reserved for just a handful of the planet’s most elite, and arguably insane, endurance athletes. Perhaps you can describe, first, what is Death Race? Patrick: Death Race is considered the “most insane extreme endurance race in the world.” It’s conducted every year in the Green Mountains of Vermont, where racers go 3-4 days of enduring unrelenting challenges geared to beat you down physically, emotionally and mentally. In the recent Death Race of 2018, 100 racers were invited after a qualifying process that included answering written questions and submitting a video. Here is my video submission explaining that “pain” is why I’m seeking to compete in the Death Race. On race day, July 11, roughly 87 racers had the fortitude to show up. Nearly half regretted it, because they quit less than 24 hours, some as quickly as 3 hours, which was unprecedented. 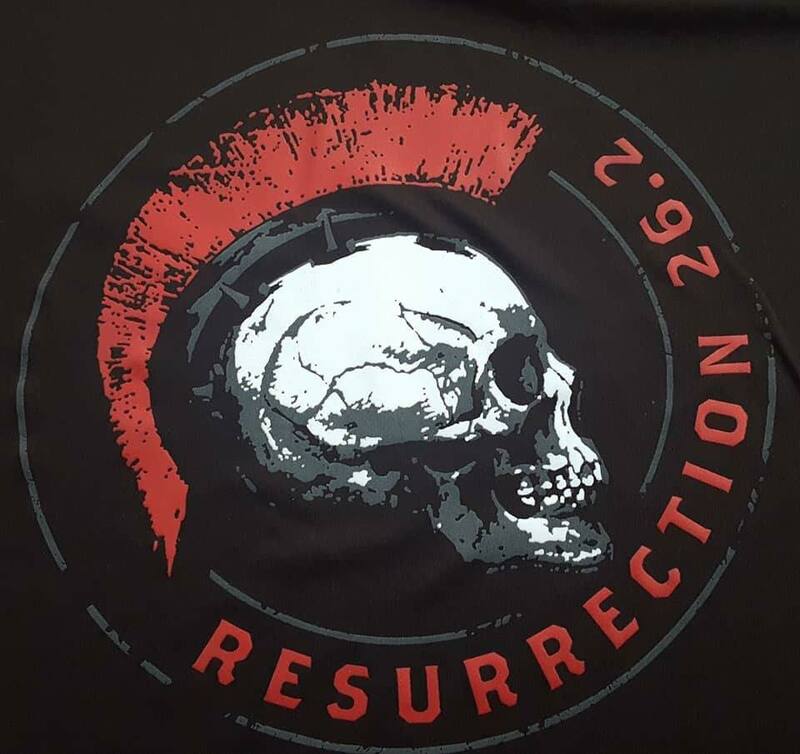 The 2018 Death Race, themed Resurrection, proved to be the hardest in the race’s 13 year history. Jonathan: From the whole planet earth, only 100 people were invited – wow. I have to ask, because we are friends, how old are you, and what is the average age of the competition? Patrick: Death Race has a global appeal. We had extreme endurance racers from around the world including Canada, Scotland, England, Eastern Europe and the United States. Death Race scares and scars a lot of elite endurance athletes who either fear injury or in many cases, fear failure, which the latter is prevalent in the business world. Certainly, Death Race isn’t for the faint of heart. The most challenging aspect of the race is the uncertainty factor. No one knows what the challenges will be ahead of time. Each year the race is different. Death Race is famous for not having a starting line or time, and racers don’t know when the race will finish. I’m 49 years of age and feel great! The average age at the race was around 32. I believe I was the second oldest racer. The oldest was a Canadian at 51 who went hard 26 hours into the race. Jonathan: OK, so let’s get down to it, how did you train for the Death Race? Patrick: If you’re training in the gym, then you’re not going to last in Death Race. In order to have any chance of going deep in Death Race, and avoiding serious injury, I do what’s called functional training. Functional training is uncomfortable, miserable and you dread doing it. However, it creates an edge that prepares me for an inconceivable crucible of pain, misery and sleep deprivation. My death race training is based out of my back yard. I have a 200 pound log, a cinder block, an axe and a ruck with 50 pounds of weight. 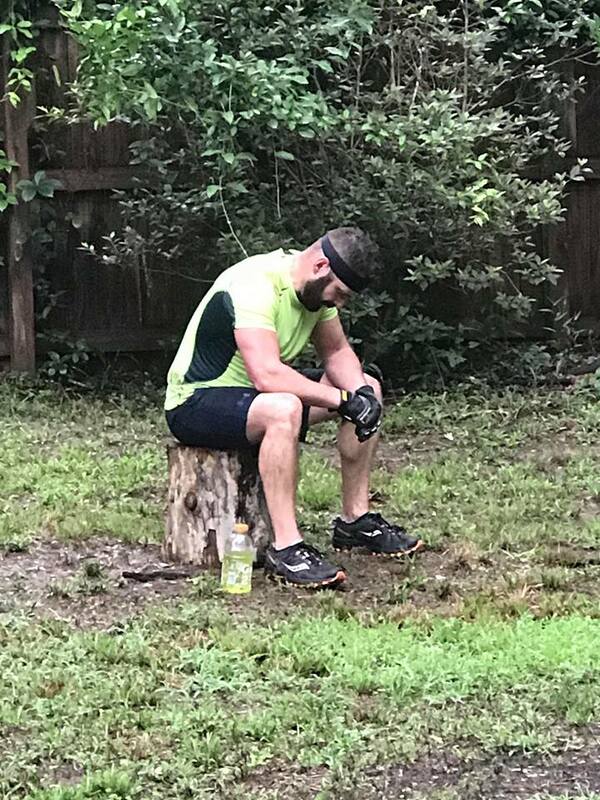 I will flip the log end-over-end for hours, do hundreds of burpees, bear crawls, chop wood for hours and then carry a 40lb cinder block, with my 50 pound ruck for up to 10 miles. On quasi-rest days, I will bike 20 to 30 miles or go to the gym to do traditional weight lifting or go on the Stairmaster for a few hours. The Tallahassee Democrat did an extensive feature on my Death Race training just before I left for the Death Race. Here is the link for those who want to see more in-depth: Tallahassee Extreme Endurance Athlete Tackles Death Race. Jonathan: Do you ever sleep? Patrick: Let’s just say that I see a lot of sunrises when I’m finishing up my Death Race training for the day. I begin in my backyard before going miles out in the middle of nowhere or rucking up and down the highway. Part of my training includes fasting for over 24 hours and then rucking overnight until dawn just to measure my stamina and mental faculties. I’ve had more than a few cops pull me over at 3am to see what’s going on. It’s not normal (laughing), which I get. Jonathan: I’ve referred some clients your way in recent years, and when I do, I usually mention your Death Race training, and note something like, “By the time we’ve made it to the office, Patrick has already run 25 miles with a 50-pound pack on his back.” It seems incredibly relevant to your work ethic. How do you feel your training relates to your work as a public relations and public affairs professional leading your firm SL7 Consulting? Patrick: I’ve appreciated those client referrals and enjoyed the work that we’ve had done. No doubt, C-Suite leaders like working with someone who is a risk-taker, an adventurer, who has a drive to test his limits and take on the unknown, with a record of success. It’s an intrinsic quality that has many tangible benefits for my clients. There’s definitely a symbiotic relationship between both worlds. Crisis management and Death Race requires the ability to have a stillness of mind, while everything around you is chaotic. Clients can see one affects the other and offers added value in my strategic communications and stakeholder engagement counsel. In this year’s Death Race, we were cautioned to carry enough water to last the first 24 hours, because none will be provided. So how much is too much or how little is too little? When you’re already carrying a 55lb sandbag along with a ruck filled with 35-50lbs of gear and food, you must be able to ensure you still have mobility to be situational and responsive to the external environment. It’s very similar to crisis management and change communications, which I’ve been doing for over 20 years. Both require planning, discipline, focus and anticipation. Jonathan: You’ve often told me the race is more mental toughness than physical toughness, can you elaborate on that? Patrick: The best way to understand difference between strength and toughness is picture a bodybuilder walking barefoot over a gravel driveway: Enduring the pain in his feet and walking the entire distance has nothing to do with physical strength. It’s how long can s/he endure the discomfort or pain that his/her mind is focused on. Now put on a 40-50lb pack, while carrying a 55lb sandbag, and walk the gravel driveway for a few miles, then you’re beginning to understand the extent of mental toughness needed to compete in Death Race. It’s scientifically proven that when we are faced with something that’s taxing our strength, our minds begin to tell us to quit/stop. However, in truth, we have much more to exert than what our mind is signaling. Therefore, endurance racing is about ignoring the current thoughts of quitting and going beyond your limits. That’s what calls me to these extreme endurance races – to see if I will quit, which I haven’t to date. Jonathan: I’m convinced you have a clone, one that trains in the middle of the night, and one that goes to work during the day. That said, will either you or your clone participate in Death Race 2019? 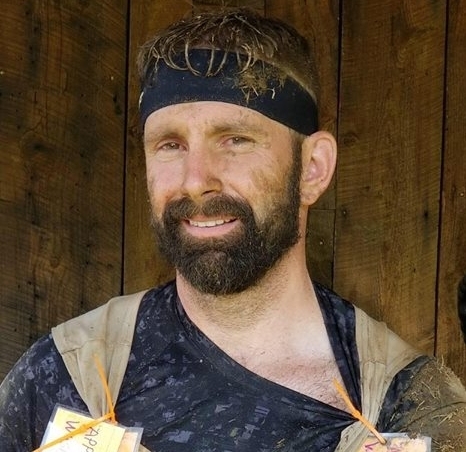 Patrick: I’ve done two Death Races, a World’s Toughest Mudder, Georgia Death Race, Ultra-Marathons, various OCRs (Tough Mudder, Spartan, Battle Frog, Savage Race) and 70.3 IronMan races, and Death Race is my favorite race - I do plan on competing again in 2019. Jonathan: I almost forgot to ask what might seem like a pretty important question. How did you do in the 2018 Death Race? Patrick: Out of hundreds who registered, 100 invited to compete, and 87 who showed up, I was one of the last 18 still racing 48 hours into the race. We rucked 17 hours carrying nearly 100lbs up a mountain, bear crawled down it, crawled in ice cold rivers, hiked barefoot, moved two 3,000lb boulders in 2 hours, held our breath underwater, carried buckets filled with stones up a mountain, did 3000 burpees for 9 hours, and then crawled on a .25-mile race track of barbed wire for over 12 hours straight. On the latter, I did 10 laps or 2.5 miles crawling under the barbed wire while fighting the threats of dehydration. There was one last cutoff that I had to overcome and that was the barbed wire drag race. The race directors never expected that 21 racers to have survived it up to this point – 48 hours in. They planned on 12 to advance, so they created this cutoff. Three racers just quit and walked off upon learning of the drag race, leaving us 18 to race in the barbed wire in near darkness. I had plenty in the tank to keep going, but my knees were torn up, so I had no speed, and I didn’t make the final 12. However, the owner, Joe De Sena said that he considered the 18 as finishers due to the punishment we endured. 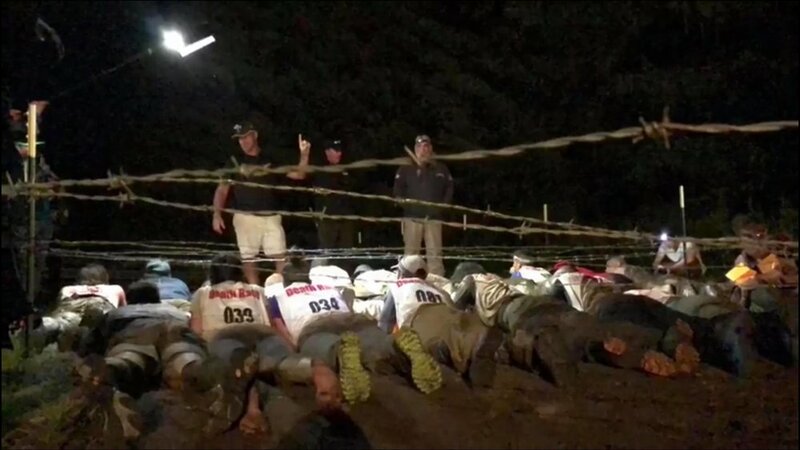 The final 12 would go on for another 13 hours pulling ropes and other physical challenges before they got their skulls as official finishers, which they fully earned. 48 Hours Into Race. The Remaining 18 Racers Prepare For Drag Race Under Barbed Wire. The First 12 to Cross Finish Line Advanced to Win Skulls (Slevin on the Far Left Row, Foreground). But actually, Jonathan, while it is an important question, you told me something before the race that bears mentioning as a truth. You said that by the time the race started, I’d already won, because I put in the hard work for months before arriving at race day. What happened there was icing on the cake. While I am proud I was one of a very small number to have made it the 48-hour mark (drag race), every single person who showed up that day after putting in the hard work to get there deserves credit. It was an elite group, and I am proud just to be a part of it. Jonathan: I hope you will continue to share your journey as an extreme endurance athlete with others. It’s inspiring. Patrick: I appreciate that, Jonathan. Before I conclude my interview, I want to try to explain the “why”. Why do I do these extreme and sometimes very dangerous races? For me, it’s about discovering self. We live in a very comfortable world, fraught with secular distractions and many illusions. It’s difficult to know who you truly are and for me, Death Race peels away these layers of distractions to reveal the well of self through the suffering and misery. In that state, you’re forced to see your character as it is and not what you may falsely project. For some, it’s a disturbing revelation that they cover up by saying they quit because they “weren’t having fun anymore.” It’s not about having fun, but rather, testing my abilities and realizing my weaknesses in training and competing. When I do, that’s when I find satisfaction in my life, which translates positively in all facets of my personal and professional profiles. Jonathan: How can readers find you to follow more about your Death Race and professional pathways? Patrick: First, thank you Jonathan for doing this interview. I hope readers will see you in the future offering exclusive guest blogs for the INFLUENTIAL e-Newsletter. Readers can find me on my various social media platforms. Check out below. About Jonathan Kilman: The founder of Converge Government Affairs, Jonathan is an experienced political advisor and high-caliber advocate for Fortune 500 Companies, some of Silicon Valley’s biggest brands, and an array of regional and non-profit world-changers. Jonathan is frequently called upon by clients to advise and help manage US and global government affairs portfolios. About Patrick Slevin: Mr. Slevin is a former Florida mayor. He is a two-time winner of the PRSA Silver Anvil Award of Excellence for Crisis & Issues Management. Influence Magazine named Slevin one of the "Great Communicators". Slevin has been recognized by Campaigns & Elections Magazine as one of the nation’s top political “Movers’ & Shakers". He is the founder and head of Florida-based SL7 Consulting (www.PatrickSlevin.com).